I’ve said it before, but I’ll say it again: there’s nothing quite like Superior. It’s where roots and rocks lay waste to west-coasters who think they’ll breeze to a course record. Where you can only feel the elevation profile – “death by a thousand paper cuts” – once the damage has been done. Where the sharp basalt shoreline rises stark from the frigid, blue knife’s edge at the meeting of the north woods and the lake that they call Gitchee Gumee… Sawtooth. The Big Dance. 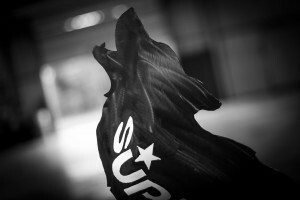 Whatever you call it, Superior is here, baby. One of the original dozen-or-so trail hundred-milers in the US, Superior doesn’t look quite the same as when it started in 1991. Now point-to-point from Gooseberry Falls to Lutsen (and featuring a 50-mile and 26.2-mile race that also end at Lutsen), the 103.3-mile race features 21,000 feet of elevation gain (and loss), 95 percent singletrack, and a 38-hour cutoff for the 250-odd (250 odd?) runners taking part. It’s impeccably-marked, and incredibly scenic, though I don’t recommend looking up, lest you spill yourself and the contents of your race vest all over the Crosby-Manitou section. (Speaking from experience, if you do this, remember to check if you still have all your GUs collected before you continue. Conditions have been cool, and they’ve been hot and humid; they’ve been muddy, and they’ve been dry; they’ve been great, and other years they’ve been terrible. Welcome to September on the North Shore. Please follow my contact info at ultramn.com for corrections to this section. Please write on my Facebook wall on in the comments section of my Instagram (@alexpkurt) with any subjective quibbles. For spelling errors, direct your complaints to Adam Lindahl at adam@tcrunningco.com or (952)239-5351. Course: Gooseberry Falls State Park to Lutsen, MN. Stats: See above. 27 States, four countries, 60 percent attempting their first Superior 100. History: Founded in 1991, it retraces the famous migratory patterns of Minnesota’s long-absent mastadons. Really? No. Tweet your corrections to @apkurt. Actual distance: 103.3 miles. You get a “100 Mile” sticker and a “5K” sticker at the end. –Mark Gilligan: founder of Ultrasignup.com, who is mysteriously seeded first in ultrasignup’s very scientific rankings. -Joe Uhan: Minnesota native, Ultrarunning Magazine contributor, physio extraordinaire, and 2012 Western States ninth-place finisher (16:13:14). -Adam Schwarz-Lowe: 2014 winner after multiple “bridesmaid” performances. Has apparently been helping Uhan recon the course. -Mallory Richard: 2015 Black Hills (*overall*) 100 champ, 5th at Bighorn this year. -Tina Johnson: 2nd last year. -Casey Ulman, Crystal Hutchings, Joe Fejes, Brian Klug, Marcus Berggren, Scott Hoberg, Gary Davis, Frank Pipp, Garrett Peltonen, Rob Henderson, Steven Graupner, and this is why we run the race and don’t hold it on paper. -Chrissy and Stan Ferguson: founders of the Arkansas Traveler races – which like Superior were founded in 1991. -GRAND MASTERS: John Maas, Doug Kleemeier and Bob McGrath (and that’s just the local bunch) are in their 50s now, so this should be an exciting race. Shelley Groenke and Janet Hausken could battle on the women’s side. Stuart Johnson (Shawnee, Kansas) is looking for #19; Susan Donnelly (Oak Ridge, Tennessee) #16; Daryl Saari (Rochester) and Jerry Frost (St. Louis) #10 – only two other people in the history of the race have 10 or more finishes; Eugene Curnow and Chris Hanson. Course: Finland to Lutsen, MN; 12,500 feet of elevation change. Stats: 175 runners, 56 female; 18 states, three countries. 78 percent attempting their first Superior 50. -Michael Borst: third-fastest time on the modern 100-mile course; won Voyageur big this year. -Kurt Keiser: Won the Zumbro 50 and Afton 50K; former Team USA Minnesota athlete. -Brent Loberg: second last year. -Toby Henkels: former U of MN All-American and Big Ten Champ at 800m. -Lindsay Henkels: Zumbro 50 winner, also a former Gopher. -Rochelle Wirth: contending for both Grand Masters and overall titles. Finished third at Superior 50K in 2012. -Kelly Johnson-Runions: won the marathon last year. Course: Schroder to Lutsen, MN. 5,500 feet of elevation change. -Jake Hegge: won the 100 last year and set a course record; second at Voyageur this year. -Ben Kampf: won in 2013 and 2014, second last year. His face is probably red right now. -David Hackworthy: third at Afton this year. -Andy Holak: should have a shot at the Master’s title (those were John’s words, not mine, Andy). -Christine Loza: won the Chippewa 50K and third at Afton this year. -John Horns: trains with Loza, and two-time 100-mile winner, could have a shot at the Grand Master title; Rob Class, 56, could give him a race, though. 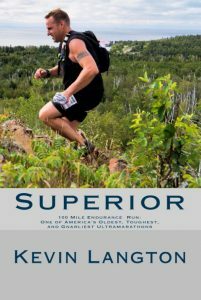 Those wanting a more thorough and…accurate take on Superior’s history should check out Superior: 100 Mile Endurance Run, One of America’s Oldest, Toughest and Gnarliest Ultramarathons by our own Kevin Langton. Word is he’ll be selling copies at the race.